Vascular diseases affect the blood vessels that circulate blood between the heart and lungs. Vascular diseases are fairly common as people age. Untreated vascular diseases can result in serious health problems or even death. Complications of vascular disease include tissue death and gangrene which could lead to amputation. Preferred O & P Services offers orthotic and prosthetic solutions to patients suffering from complications of vascular disease. Signs of deep vein thrombosis (blood clot) are swelling and discoloration of the affected limb. There may be no symptoms until the blood clot becomes big enough to block the flow of blood to the affected limb. Symptoms may come on suddenly and require urgent medical care. Complications resulting from a blood clot can result in orthotic or prosthetic care being prescribed as part of a comprehensive rehabilitation program. The practitioners at Preferred O & P Services treat patients whose extremities have been compromised by vascular diseases. 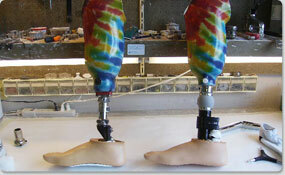 Footware for diabetic patients is a common orthotic treatment for patients suffering from neuropathy. If you are at high risk for vascular disease it is best to lead a healthy lifestyle with plenty of exercise, proper nutrition and quit smoking.